A series of storms expected to arrive in California starting Tuesday night could bring heavy rains onto landscapes denuded by wildfires. Officials are warning that could mean flooding, mudslides, and more dangerous "debris flows," where the flowing mud picks up loose debris on the surface, like trees, boulders and remains of destroyed buildings. A storm forecast to arrive tonight and continue through Wednesday could bring several inches of rain to Butte County, where the deadly Camp Fire has scorched more than 150,000 acres. "This could quickly become a dangerous situation," says the National Weather Service flood watch. "Residents, emergency responders, persons traveling within the burn area should remain alert, and take action should heavy rain develop." There are few residents in the fire zone who could be affected by flooding, says Tony Hernandez, Cal Fire public information officer. "Some residents have been allowed to return to their homes," he says, but "the fire impact area has virtually no public access granted so far." The rain could pose a threat to teams working in the fire zone — including utility workers and people working to find and identify human remains — who will have to contend with, at minimum, slick roadways. People traveling along portions of Highway 70 and the Skyway in Butte County should be prepared for flooding, rock falls, or debris flows. 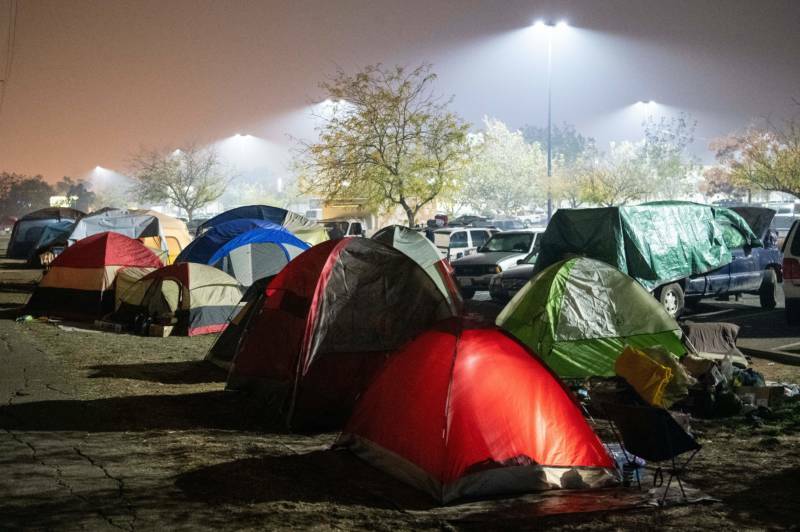 At a tent encampment near a Walmart in Chico, set in a vacant lot that's known to flood, some evacuees have left ahead of the rain. But others are staying. Volunteers have been bringing in tarps, as well as pallets to get sleeping bags up off the ground. Crews from an array of state, regional and local departments — emergency services, transportation, roads, water — are spread across Butte County, assessing the potential for damage and beginning prevention: cleaning culverts, installing straw barriers around burn scars to prevent ash from getting into rivers, and prepping crews to clear storm drains during the rains and monitor for danger. A flash flood watch is in effect through Friday morning for the burn zones of not just the Camp Fire, but also the Carr, Delta and Hirz fires that burned in Shasta County earlier this year, and the Mendocino Complex Fire which scorched Lake and Mendocino counties this summer. 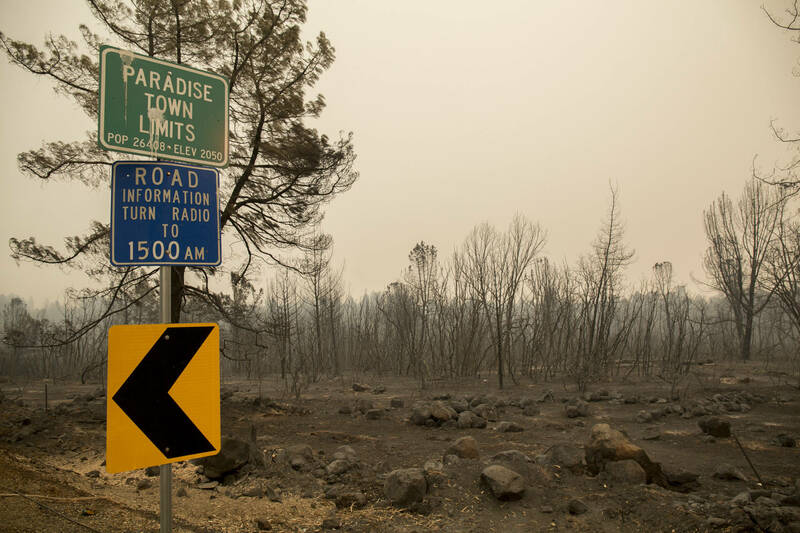 "A wildfire really affects the landscape, especially these intense wildfires that we've had over the last year," says Chris Orrock, a public information officer with the California Department of Water Resources. "Areas like Sonoma and Napa that had the wildfire last year, they're still at risk for two to five years of flooding in those areas." Wildfires destroy trees, brush and plants that would normally soak up the rain. According to Orrock, wildfires also prevent the soil itself from being able to absorb water, instead creating a waxy surface that repels rain and can lead to flooding. Orrock says people need to be aware if they're in an area at risk for flooding and should be prepared to evacuate if conditions demand it, though the damage will depend on how much rain actually falls. "A light amount of rain might just pool up in the landscape," he says. "If we get to a moderate amount, it might create some flooding. If we get some of these huge microcells like they saw down in Santa Barbara last year, it could start mud flows." At least 21 people died in January in mudslides and debris flows formed when heavy rains hit the Santa Barbara landscape that had been torched by the Thomas Fire the previous month. "So that's what we're worried about in these areas that have not been able to recover," Orrock says. "They don't have the root structure, they might still have debris on top, [including] dead trees, dead vegetation and burnt out homes that can turn that flooding to mud flow into a dangerous debris flow." Napa County established a flood preparedness plan last year after the deadly North Bay fires, and that plan is still in place, says Kevin Twohey, Office of Emergency Services coordinator for Napa County. He says the county isn't expecting any problems with this week's storms. "We actually welcome the rain," he says. There's reason to welcome rain. With the exception of the Inland Empire, California has been dry this fall, with little rain across the state's major watersheds. In fact, over the past 30 days, most of California has had less than 5 percent of the average rainfall.